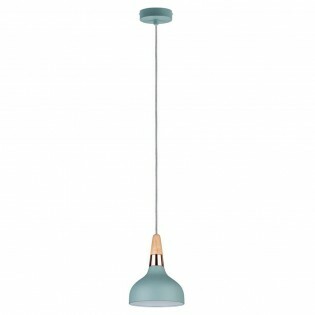 Pendant lamp ideal for living room, dining room or bathroom because its IP44 is protected against splashing water. Its white glass dial will give your room a very special vintage touch. Set the cable length as needed (can be cut only once). Dimensions: Height 173 cm. Diameter 20 cm. 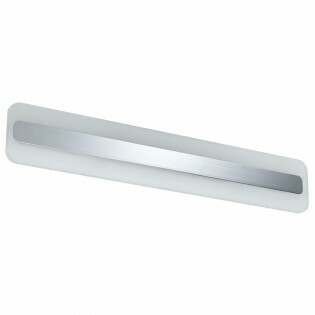 Wall light with rectangular design composed of white methacrylate and chromed metal. Ideal for bathing in the mirror area thanks to its IP44, protection against dust and water. Integrated with 9 W LED lighting, warm colour temperature, maximum energy efficiency technology. Dimensions: Height 10 cm. Length 4.2 cm. Width 60 cm. Nordic ceiling lamp in a white that conveys harmony and elegance. lampshade with die-cast metal construction and conical design. The light will diffuse easily between the rooms. Ideal for lighting living rooms, dining rooms or bathrooms, thanks to its IP44, protection against dust and water. Dimensions: Height 180 cm. Diameter 29 cm. Ceiling lamp from the collection Cameo special for bathrooms thanks to its IP44, protection against dust and water. 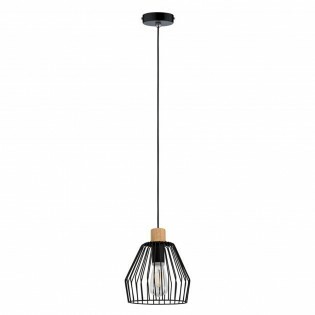 Manufactured in black wood and metal and lampshade with a cage design that houses a decorative bulb (not included). You will get a stylish and modern vintage style. Dimensions: Height 180 cm. Diameter 22 cm. Disa ceiling light. It includes marble in its manufacture, both at the base and at the top of the lampshade. This one has a plate design made of metal and in a pink color that will give the space its own style. Perfect model for rooms such as the kitchen or living room. Dimensions: Height 143 cm. Diameter 35 cm. Ceiling lamp with cork at the top of the lampshade and black textile cable. Its lampshade has a cylindrical design and is made of smoked glass. With a decorative filament bulb LED the light effect will be spectacular. Ideal to illuminate living rooms, dining rooms or bedrooms. Dimensions: Height 150 cm. Diameter 18 cm. Ceiling lamp from the collection Elia with class and style. The special touch is provided by the cork, which surrounds the smoked glass lampshade. This material allows light to pass through easily. It will look great in rooms such as the kitchen or living room, placing several of them in series. Dimensions: Height 150 cm. Diameter 20.8 cm. Ceiling lamp from the collection Embla with large diameter metal lampshade that with a white finish and a golden touch will stand out in your decoration. Ideal for the kitchen, the living room... environments where modernity and modernity predominate. Dimensions: Height 150 cm. Diameter 30 cm. Galacta ceiling lamp with interlocking bars forming a sphere design. The bulb is fully displayed, the main feature of the vintage style. A decorative will be the best choice for this design. IP44 protection certificate against dust and water, ideal for lighting bathrooms. Dimensions: Height 188 cm. Diameter 35 cm. 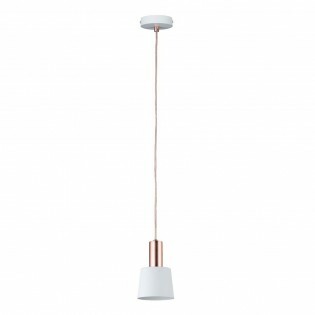 Ceiling lamp with a simple but unique design with a thin copper metal tube accompanying your white tulip. The cable is made of fabric and is the same colour as the tube. Perfect for you if you need a decorative lamp that adapts to the white or light tones of your room. Dimensions: Height 172 cm. Diameter 12 cm. Ceiling lamp for modern and modern rooms, with chrome finish metal tube and dark grey lampshade. Ideal for lighting with several of these designs in-line or as ambient light. Ideal for kitchens, living rooms, bedrooms...or bars and restaurants. Dimensions: Height 172 cm. Diameter 12 cm. Helin ceiling lamp handmade with high quality materials, cement that gives it an industrial touch and opal glass that reflects light in a very special way. All made completely by hand. 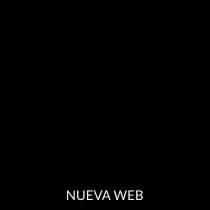 Fabric cable. Its modern style is ideal for all types of decorations in areas such as the living room or dining room. Dimensions: Height 175 cm. Diameter 19 cm. Ceiling lamp from the collection Juna with one point of light. Cylindrical piece of wood at the top and copper metal at the bottom. Main metallic structure in a beautiful satin green colour. The overall design fits perfectly in kitchens or dining rooms. Dimensions: Height 172.5 cm. Diameter 16 cm. Ceiling lamp with light points distributed at different heights. Its large dimensions make it necessary to have large rooms such as the living room or the dining room to place it. The material that composes it is metal and wood in beautiful finishes, in a very youthful satin green. Dimensions: Height 170 cm. Diameter 46 cm. Maiga ceiling lamp in an extraordinary combination of materials. metal lampshade with marble top. Small detail in matt gold colour. A careful design down to the smallest detail, handmade. Perfect for kitchens in the worktop area, the living room.... Dimensions: Height 140 cm. Diameter 23 cm. 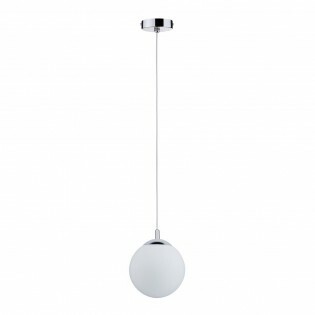 Ceiling lamp fine and elegant with a white spherical lampshade made of glass. Textile cable (can be shortened only once). Ideal for the living room or dining room, placing several of them in series. Brass structure. His vintage style is one of the most fashionable today. Dimensions: Height 17.3 cm. Diameter 20 cm. Ceiling lamp from the collection Neta with light-coloured wooden lampshade made entirely by hand, white metal base and white textile cable in the same colour. Ideal for modern or rustic decorations in rooms such as the living room, dining room or bedroom. Dimensions: Height 148 cm. Diameter 38 cm. 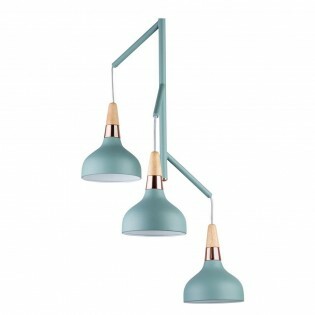 Norell ceiling lamp with three lighting points at different heights. Configure them as you wish and get stylish and modern outfits. Hand embossed completely in cement with a metal strip around it in matt gold colour. Ideal for large rooms such as the living room or dining room. Dimensions: Height 170 cm. Diameter 20 cm. Ceiling lamp from collection Pendulum with minimalist design, cement lamp holder. Ideal for decorative light bulb placement and fabulous vintage style. You will gladly decorate rooms such as the living room or the dining room with a magical ambient light. Dimensions: Height 9.5 - 21.6 cm. Diameter 5 cm. Verve Ceiling Lamp with IP44 certification to protect against dust and water. Place it easily in your bathroom, dining room, living room or kitchen. Metal ceiling base and concrete lampshade with chrome-plated metal detail at the top of the lampshade. Ideal for modern or vintage decorations. Dimensions: Height 176 cm. Diameter 20 cm. Floor lamp. Black metal structure and beige fabric lampshade. Rounded base and easily tiltable structure for you to direct the lighting as you need it. In rooms such as the living room, dining room or bedroom you will find a modern touch of great beauty. Dimensions: Height 183.5 cm. Length 43 cm. Width 186 cm. 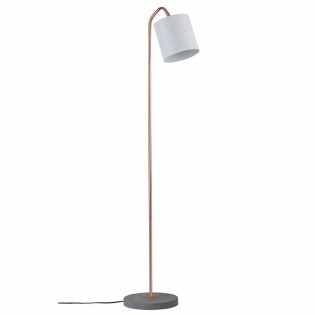 Enja floor lamp. Black lampshades that will bring elegance and sophistication to the room and fabric manufacturing. Main metallic structure and marble base with copper-coloured detail. Elegance and sophistication in the same ensemble. Perfect for the living room, dining room or bedroom. Dimensions: Height 160 cm. Diameter 24.5 cm. Floor lamp with classic shapes and structures made entirely by hand, white fabric lampshade, marble base and metal main part. The matt gold frame on the lampshade gives it a classic touch of difference. 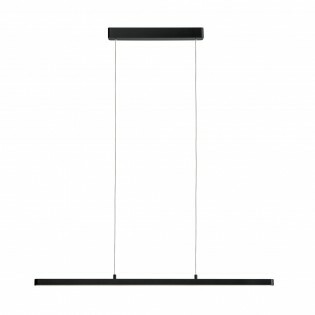 The ideal lamp for living rooms, dining rooms or bedrooms, you will get a perfect ambient light. Dimensions: Height 160 cm. Diameter 24.5 cm. 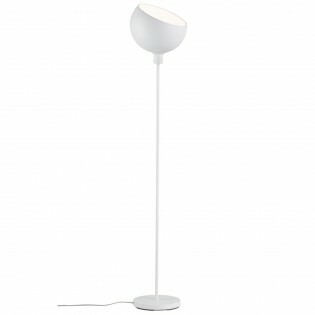 Floor lamp with spherical lampshade that you can change position to direct the lighting to where you want. Made of metal with a white finish. 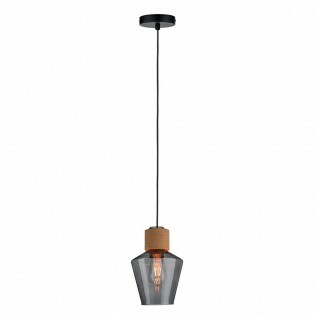 Ideal for the living room, dining room or bedroom where it will offer very nice ambient lighting. Dimensions: Height 152.2 cm. Diameter 30 cm. 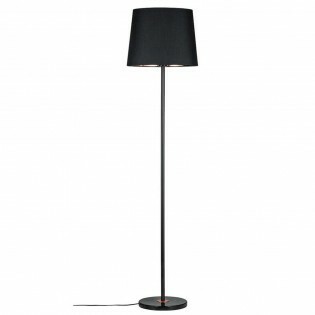 Haldar floor lamp. 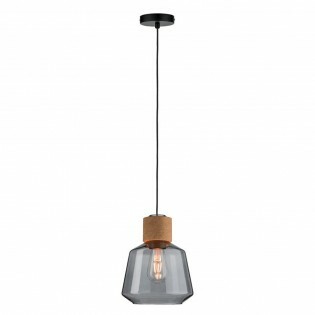 Modern and simple with a very fine wire cloth cable running through the whole of its bronze metal structure and white metal lampshade. You will be able to direct the light to where you need it and get a beautiful and welcoming ambient lighting. Dimensions: Height 152 cm. Diameter 23 cm. 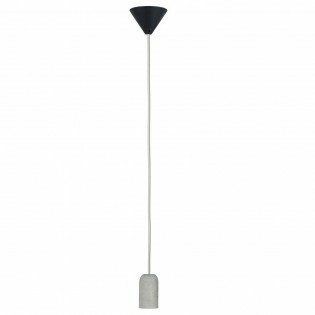 Haldar II floor lamp, combination of two colours, chrome on the main part and dark grey on the lampshade. Includes On/Off switch. The special touch is provided by the very thin cable made of fabric. With this lamp you will be able to illuminate small corners of the home with a very modern touch. Dimensions: Height 152 cm. Diameter 23 cm. 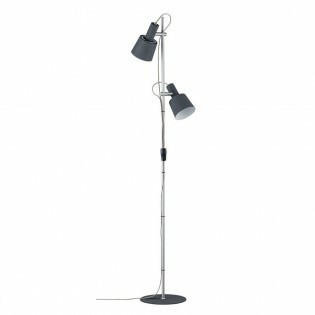 Floor lamp with two lights, each in one height and position. It sets up your positions and sets up beautiful, elegant lighting. All-metal construction with dark grey and matt chrome finish. Combination of colours for modern and modern rooms. Dimensions: Height 152 cm. Length 30 cm. Width 23 cm. Floor lamp for modern rooms with green metallic structure, bronze and wood detail on the lampshade. All made completely by hand. The living room, dining room and bedroom are the best rooms to place this lamp. On/Off switch. Dimensions: Height 51 cm. Length 25.5 cm. Width 18 cm. 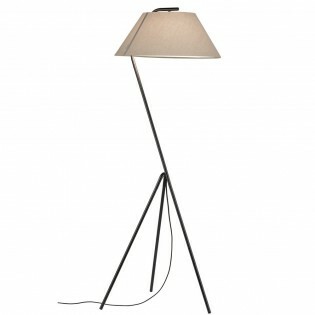 Floor lamp from the collection Kelt modern and casual style with full grey finish and fabric manufacture. Let the light through very gently. Perfect for the dining room, living room or bedroom. On/Off switch included. Dimensions: Height 62 cm. Diameter 35 cm. 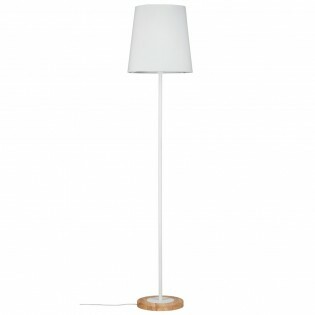 Floor lamp Neta with white main part and wooden screen, together they make a beautiful and special combination. They are colors that will fit in multiple types of decoration. Manufactured 100% by hand with a carefully designed down to the last detail and On/Off switch included in the base. Dimensions: Height 151 cm. Diameter 35 cm. 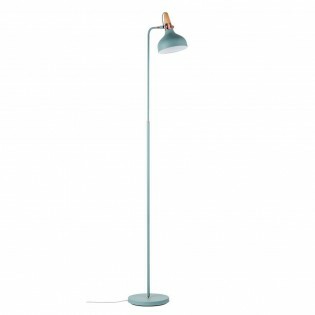 Oda Floor Lamp. Metal structure with copper and cement finish on the base. White tulip. Combination of materials and finishes typical of the industrial, modern and vintage style. Ideal as a base for living room, dining room or bedroom. Completely handmade design with On/Off switch included. Dimensions: Height 137 cm. Diameter 25 cm. 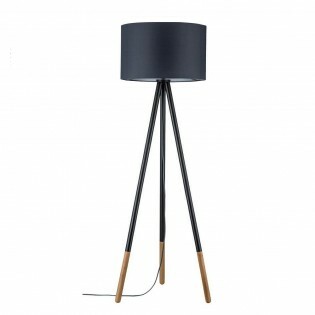 Rurik floor lamp. Beautiful, elegant, sophisticated.... For modern or classic decorations. The entire design is handmade. Its structure formed by a triple foot is metallic dark blue with a touch of wood on the bottom. Dark blue textile lampshade. Dimensions: Height 153 cm. Diameter 53.8 cm. 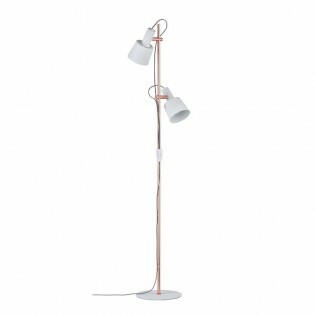 Nordic style floor lamp. With a white finish, the purest colour in a perfect combination with the wood of its base. The lampshade is made of fabric, and the main structure is metal. Ideal as a living room, dining room or bedroom base in modern and classy decorations. Dimensions: Height 161.5 cm. Diameter 35 cm.